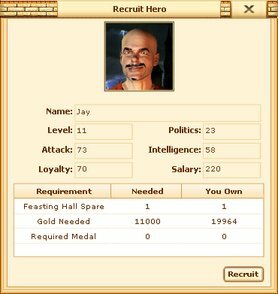 Heroes play a vital role on Evony, this includes speeding up troop recruitment, boost the speed of building construction as well as research. To recruit a Hero players need an inn and a feasting hall. Players can recruit different types of Heroes, which specialise in providing different bonuses. Players can have multiple Heroes and equip them with armor to improve the bonuses they give to armies when attacking villages or defending against attacks. After recruiting Heroes players will need to pay them a salary in order to maintain them. Players can appoint any of their Heroes as Mayors in order to have them boost the production of resources in town. Each Hero can be upgraded after they level up and even capture other Heroes during battles. Every Hero will have Energy, this will diminish as players use them to attack villages and it can be replenished via use of various items.